HomeTypeAhead.js – making it readable and “why dojo?” I get it! TypeAhead.js – making it readable and “why dojo?” I get it! And as soon as I look through this I get why IBM went with dojo. 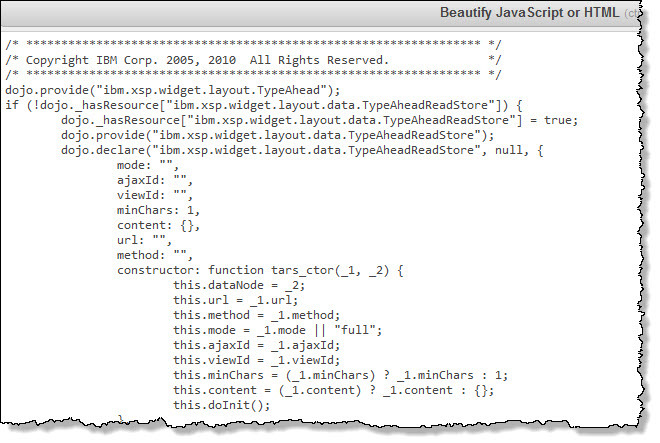 It is not about the pretty interface (which jQuery wins hands down) it is about the programming framework. The provide, declare, hitch capabilities within dojo allow for class object creation with locally scoped variables and many other cool things. jQuery does not provide a framework for this, it doesn’t try to either. You can always create class objects manually and that is what people write around their jQuery. Dojo provides the class framework directly and the TypeAhead.js is a fantastic piece of work. One of these days when I have nothing better to do I will break down how it works. Hi Marky. Thanks for this insight. I’m having major battles deciding on which framework to use. I always try my best to go with Dojo, but JQuery just looks so much better. Very soon I have to make this decision again with a mobile interface I am working on, and so far jQuery has a much more appealing SplitView Control than Dojo.